Biologist and physicist Gabriele Rabel (1880-1963) was born into a prosperous family in Vienna, Austria. The youngest of her three siblings, Gabriele was accepted into the University of Vienna, where she studied biology under the tutelage of Professor Richard Wettstein. Rabel's interest in biology led her to conduct experimental work on color adaptation of plants to their surroundings. Possessing an ever-curious mind, Rabel developed an interest in theoretical physics, and was influenced by Theodor Des Coudres at the University of Leipzig, while following the work of Max Planck and Albert Einstein at the University of Berlin. Her dissertation, "The Intensity of Certain Lines of the H-Spectrum as Dependent on Gas Pressure," earned her a Doctorate in Physics. A diagnosis of manic depression in 1923 led Rabel to pursue philosophy, particularly Rudolph Steiner's concepts of anthroposophy and the tenets espoused by Ernst Mach. Having published several articles in professional journals, Gabriele became intrigued by philology. She conducted research at the Goethe Archives in Weimar, which resulted in perhaps her most prominent work, Goethe und Kant, published in 1927. That same year, Rabel embarked on a four-year lecture tour of the United States. Rabel was working as a scientist in Germany when she agreed to become a regular contributor to Science Service sometime in 1932. It appears she was willing to write summaries of topics from a wide range of fields, from paleontology to medicine (syphilis), continental drift to psychotherapy and poetry. Often, the manuscripts on subjects far out of her field were returned, and Rabel did not refrain from occasional complaints about those rejections to the biology editor Frank Thone. Neither science nor journalism were immune, however, to the implacable forces reshaping the international context. Rabel's relationship with Science Service soon became affected by the economic and political situations in the United States and Germany. In the spring of 1933, as the economic depression deepened, Science Service began cutting back on the articles it purchased from stringers. On March 6, 1933, Frank Thone informed Rabel that "the monetary crisis which has suddenly developed in this country" had caused them to suspend payment for manuscripts. Rabel's letters indicated that she was aware of the situation ("I read awful things about America and I am alarmed as to the fate of Science Service") but everyone was still hoping for better times. As Thone wrote, "We hope that eventually the financial sky will clear sufficiently" to allow them to purchase external material again. In April 1933, Rabel informed Thone that because the political situation in Germany had deteriorated, she had moved back to Austria: "At last, I decided to go home, and here in Vienna I should find plenty of fine things for you. 'Tis just too bad that everything is so foolish and the world has gone crazy once more . . ."
As of June, Science Service was again purchasing manuscripts from Rabel and she was optimistically planning to establish an Austrian version of Science Service, which might broker scientific material internally and cooperate in some way with the American organization. A year later, however, in June 1934, Watson Davis wrote that "international conditions" were in such a state that he could not contemplate any such effort of international collaboration. Before World War II began (some time before May 1940), Rabel moved to England. A prolific writer, she was known later in her career for her translations and discussion of philosopher Immanuel Kant, and numerous scientific journal articles on a broad range of topics including theoretical physics, philosophy, evolution and genetics. Dr. Gabriele Rabel died on August 27, 1963 in Cambridge, England. Rarely with idle hands, she was working on a biography on Kaiser Karl, the last Hamburg Emperor throughout her final days. 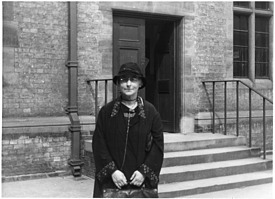 Her papers, diaries, and unpublished manuscripts are at the Churchill Archives Centre, Churchill College (The Papers of Gabriele Rabel, 1893-1958). The Papers of Gabriele Rabel, 1893-1958, Churchill Archives Centre, Churchill College.